It's past 8pm this Sunday evening, and I still have not cracked open my students' books to lesson plan, nor my Korean textbook to study. Ahhh yikes! During a G+ Hangout with JJ this morning he gave me some ánimo to take a shower and go to the grocery store, even though I could have gotten by with what little I had left in the house. It is much chillier today, but the sun was shining so that felt good on my face. Rather than the smaller grocery store that's a few minutes closer to my house, I went back to the larger grocery store close to my school. This is the evil grocery store I went to on my second day in the country, the one in which I got so frustrated because I couldn't find rice! Surprisingly, I happened to stay clear of that grocery store for over two months -- this was my first trip back! Turns out it's not evil after all, just as I suspected. I was merely overwhelmed and jetlagged the first time I went in, back at the beginning of September. It has a bigger variety than the smaller grocery store I had been going to all these weeks. Just outside of the grocery store was a huge tent with tables and racks of jackets and other warm winter things. I actually went there first to see what this tent was all about. 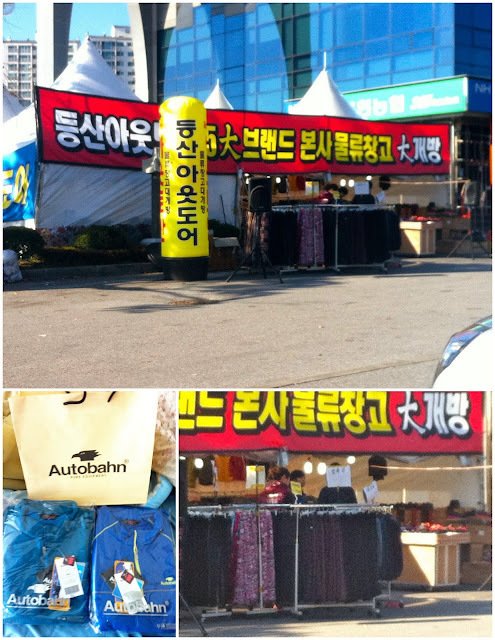 They were selling "Autobahn" products, which seemed to be an upper-end sports clothing brand. You know, the stuff that dries fast because it's made out of special material. All of these products were marked way down though, and they looked warm. I found some blue things to look at, and then a man working in the large tent helped hand me things to try on. He talked to me in Korean throughout my whole visit, and I nodded or shook my head, depending on what I thought he might be saying -- hah. I ended up purchasing two items whose price tags read W 89,000 each (over $80), but one cost 19,000 and the other, 29,000. I also usually buy used, not new -- but the quality and sale prices of these items seemed too good to pass up. Plus I need warm things. Although these two jackets are the same size on the tag (and I tried stuff on beforehand), the dark blue (on right) is a bit bigger than ideal. (I tried on a purple one of the same size in the tent, then decided I liked it but wanted the blue one. 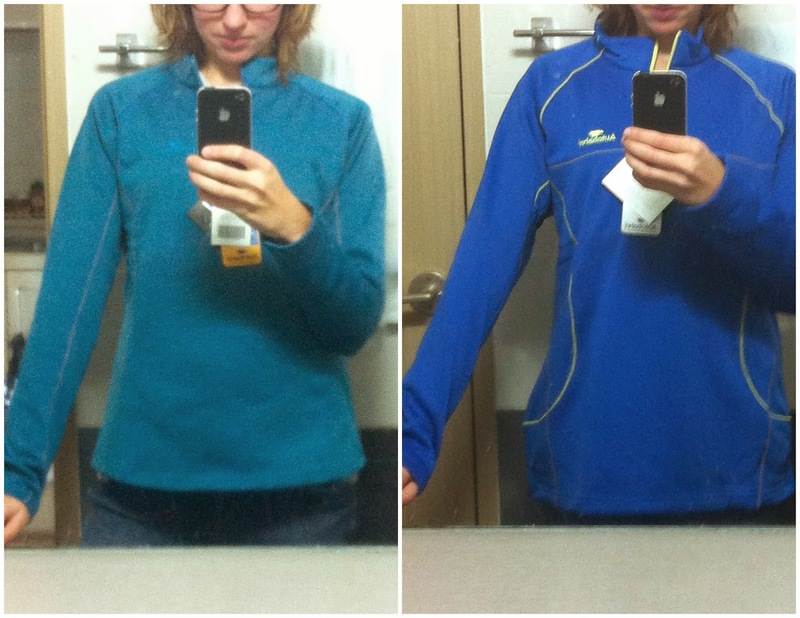 Perhaps the blue one is a different style from the one I tried on or something (mens vs. women's? ), but whatever. I did not feel like walking back and trying to explain myself to exchange. 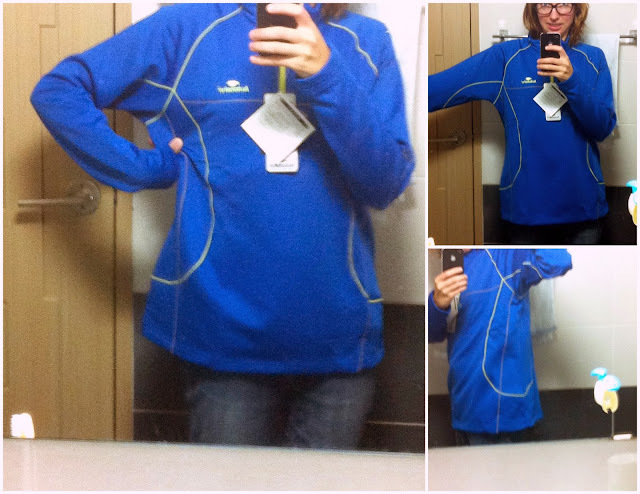 Besides, I still like the length of the sleeves, and this way I'll have space to wear it over things!